Richard Powell of Host Pond Web Hosting in Portland Oregon here. I’ve stood in witness of the many complaints over the years of how Facebook controls our collective data, and mines this data for profit. We, as participants, give them this right to use and control and own our private information when we signup. And yet, there have not been any viable alternatives that have enticed many people into leaving the latest social network giant that is Facebook. Though, there are indeed a few alternatives. Last year, I installed a test pod for the Diaspora* social network. Unfortunately I was not impressed with the administrative mechanism, and I was not confident I could get enough people to join to try it out. It was at this time last year when Friendica emerged onto my radar as a possibility. The idea is simple. The user decides where to put their social networking account. And you can even choose to have it on a domain name that you own. For example, I could install my own social network hub on one of my personal websites, such as https://www.techdruid.com or http://lucidheart.com. Then, I could invite others to share or connect by sending them an email style social network address, such as Richard@TechDruid.com or Richard@LucidHeart.com. In this case, I would have complete control over how I share and interact with my connections. It would be a decentralized social networking platform, and there would be no large evil corporation profiting from my information unless me, or my connections approved of it. Yes, you must take responsibility and be selective about who you friend, if privacy is a concern for you. If you connect your Friendica account to your Facebook account to share with your Facebook friends who don’t use Friendica, then the moment your post/information hits Facebook, you have no control over it on that end anymore. But, at least you’ve had the *choice* with this method. I’m in a unique position when it comes to such social networking platforms like Friendica, because I have server resources and bandwidth readily available to me at a moments notice. I can install and setup a Friendica hub and start playing around with it within a few days if I so desired. And I can freely invite people to join my network at no immediate cost to me (other than time). I am hereby offering to set up such a Friendica social networking hub if there is enough interest in trying it out. If there is not enough interest, then I’m not sure I want to invest the time in setting it up. I’m certain it will require a minimum of 8 hours of my time to set the thing up, and then another few dozen hours administering and upgrading the thing over the course of first few months. I simply am not interested in making such a time commitment unless there are others willing to commit to trying out the platform and to *seriously* consider using it as their primary method for sharing and social networking. 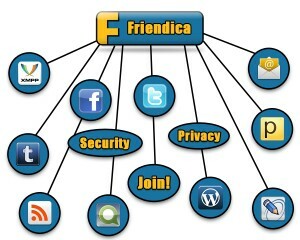 The Friendica website says they integrate with Facebook, Twitter, WordPress, and many others. So, you can share with your friends, even if they are not using Friendica as their social network website (or platform). And there are many more really awesome features that are listed on their website. Check them out here. If I were to do this, I estimate I could probably host about 1,000 members before the resources being used might require monetization in some form. This could be voluntary contributions (which I’ve not had much luck with in the past), or a nominal annual fee ($10?) to host a social account. Personally, for me, hosting such a service would not be about profiting, but about offering an alternative to the giant corporate social network model. But that being said, such things are not free to administer, or run. They require storage, bandwidth, power, and security expertise to keep the hackers out. I’m here to offer the startup resource, and provide service as a test bed for the concept. So long as people understand that if it is successful, then money would need to be a part of the discussion at some point in the future. Who knows, if Host Pond continues to grow and be successful, I can continue to sponsor the platform for free beyond the initial 1,000 members. But only time would tell how things will pan out. Anyone interested? Drop me an email at rpowell@hostpond.com if so.